Keith has now scheduled several public events for 2019.
so please check back, as we post additional details as they become available. If you have not already done so, please use the link in the footer to subscribe. Please follow instructions on the image just above. “Rushen” means distinguishing between samsara and nirvana through direct experience ... and in the process, attaining the one taste of rigpa that is free of both. It is a critical preliminary practice experience for those who are seriously engaging the path of Radical Dzogchen. 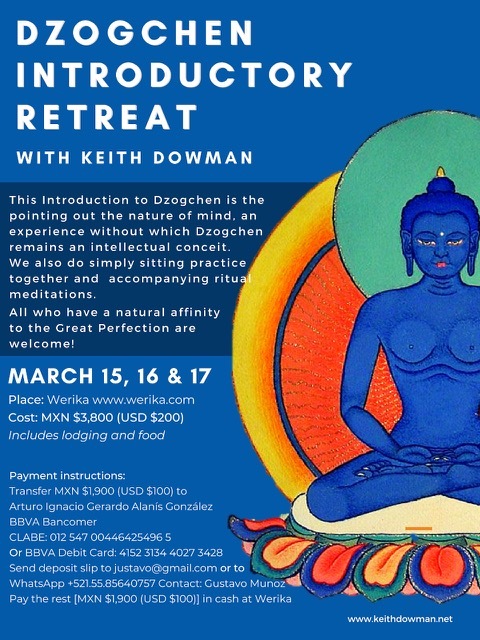 REQUIREMENTS TO ATTEND: A commitment to experience the Dzogchen teachings and some degree of personal experience in mind training and/or sitting practices such as meditation. More contact information on the image above. The Pointing Out: The outside/inside space of radiant fullness and compassionate openness: Dzogchen Instruction and practice from the Dzogchen Mind Series (semde). We are already there if only we realize it. 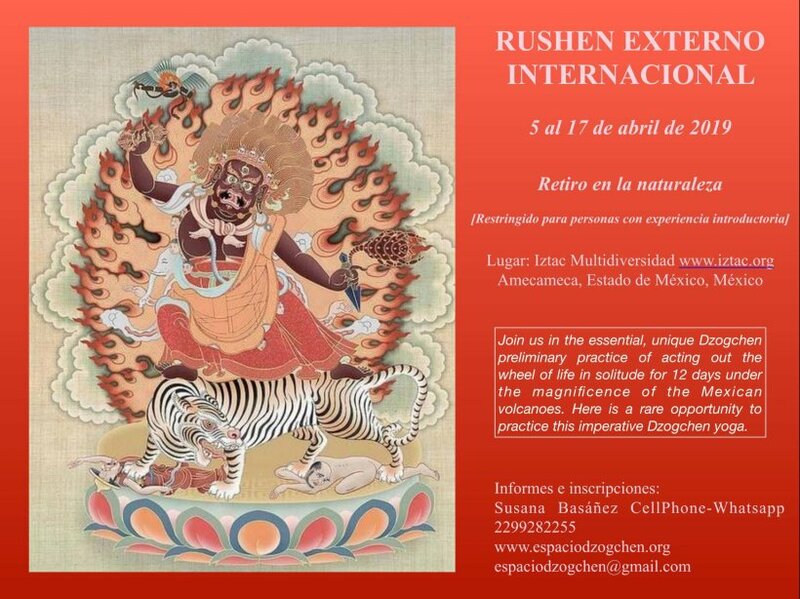 The BUSUKU retreat is the final Dzogchen retreat. Radical Dzogchen takes us there.The Trekcho and Togal instruction provides the basis for intensive two weeks of five sessions of simply sitting throughout the 24 hours of the day. You need previous Dzogchen practice for this optimal Dzogchen opportunity. In the BuSuKu, silence and detachment from life outside is imperative. But there is no imposed discipline - Dzogchen is connection with the ground of being and its spontaneity. Nonaction and nonmeditation are the keywords and simplicity itself is the mode of being. Don't let this opportunity pass you by! This is the time and place to bathe in the reality that you have always known is imminent. Technically speaking, we practice the 'breaking through' (trekcho) and 'leapover' (togal) phases of Dzogchen in series and then together. Anyone with previous attendance of a BuSuKu retreat is especially welcome and I urge you very personally to extend and deepen that experience. 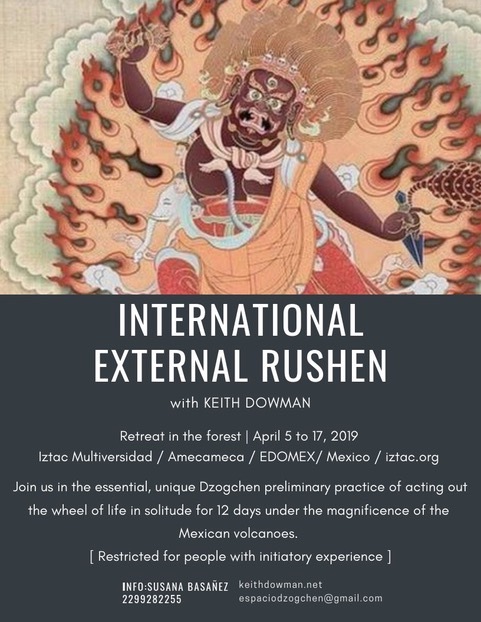 Anyone who has done an outer rushen retreat is also welcome and anyone who has not but who feels they can handle the BuSuKu schedule please. 'BuSuKu' is the indolence in which visionary experience arises in the common light of day and creative, compassionate, responsiveness is the ground of both ordinary and extreme situations: Dzogchen trekcho and togal in one schedule. This is little buddha sitting under the bodhi tree, rather than a way of worshipping the big buddha in the sky. 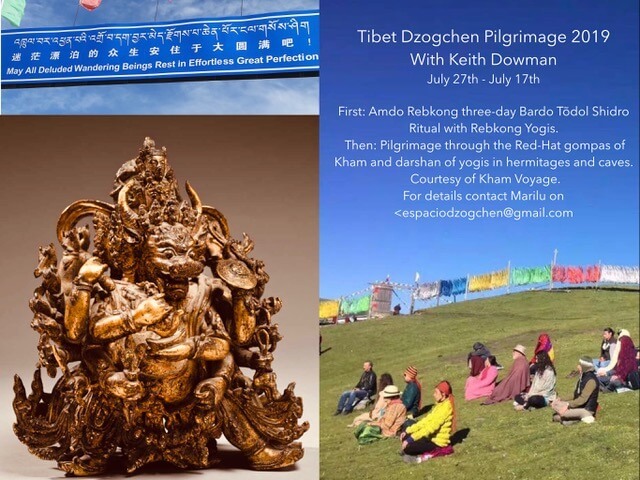 For 3-day participation in the Rebkong Shidro Drupchen and a 10-day pilgrimage through Nangchan and Kham. The previous pilgrimages to Amdo and Kham were extraordinary events and we want to repeat it with some variations. If you have a strong inclination to join us please write to espaciodzogchen@gmail.com. The number of pilgrims will be kept small so please put your name on the list immediately.